Sounds very good though for the price. No, Cambam has no automatic g-code from drawing generation. There is a plugins to select same kind of objects. The plugin has a filter you can use for selecting a size of the objects. I.e. you can select all “circle with 5mm diameter” and attach a CAM style. 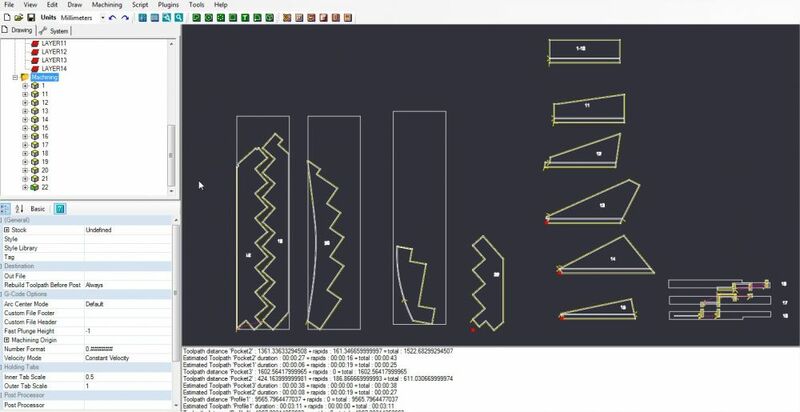 When you load a dxf file the file is usually layered with each machine operation drawn on a specific layer. In most CAM programs like Vcarve, ArtCam, AlphaCam, Enroute, etc. you can set up an import template that will look at the layer names and apply a tool path to each dxf object accordingly. So finding a 5mm circle on the appropriate layer will automatically invoke a drilling operation without having to select the circle and choose the tool. This makes the dxf to gcode entirely automatic and saves a lot of time if the dxf files contain lots of different parts. Although machining parts with few machine paths as with stair parts placing tool paths one by one is not very time consuming, when machining nested parts it can be long and error prone to have to apply tool paths one by one. I do not understand your question completely. CamBam sounds like a nice bit of software for a very nice price. Thanks very much for posting the details here, and I hope it helpful for others using DXF on CNC. I haven’t had much time to look into the details of the program but it does seem very good. One question I would have is, can you set up templates that automatically add tool paths too objects on specific layers or do you have to apply tool paths manually to each line, circle, etc. Also you can download this program and have 40 free fully functional evaluation sessions. After the evaluation period has expired, you can continue to use CamBam to edit drawings and test your post processors and g-code, however g-code output will then be limited to 1000 lines. I have missed this post . Sorry . There is little Cambam can’t do 😉 . I use it to create my gcodes for my stairprojects. I have predefined mop’s ( machine operations ) so I only have to select them when I have to . If I knew how to make a video I would do it to let you see an example starting from a DXF file. There are also lot’s of available plugins which are add ons to the program requested by users. I have requeste myself a possibility to create a different gcode for each part on the sheet. It was done in no time and I realy enjoy this program. Had a quick look at CamBam and it looks really good value. Does it do auto tool pathing, ie: can you load a DXF file and automatically apply predefined tool paths according to the layer names or other criteria? Both are inexpensive and will write Gcode, and I have used them both with Polyboard and StairDesigner . Although I’m not sure they support the exact Gcode of your machine. The problem with Gcode being that each machine will have it’s own specific Gcode. I suggest you contact them and ask if they run your machine. I know that if Vcarve doesn’t write the exact Gcode you need Vetric might write a specific pp for you. it is some time that I have logged in . I bought a reichenbacher cnc of the older generation . I am in search of a software that can translate the dxf into gcodes ( like cadkey99) . I can not find this software anymore as it is an old one . Do you have any idea of any software that can be similar in use and reasonable in price ?